The Kevin Dome is a large underground, geologic feature located in north central Montana. The project area is situated in Toole County and was selected due to its unique geological setting and subsurface characteristics. 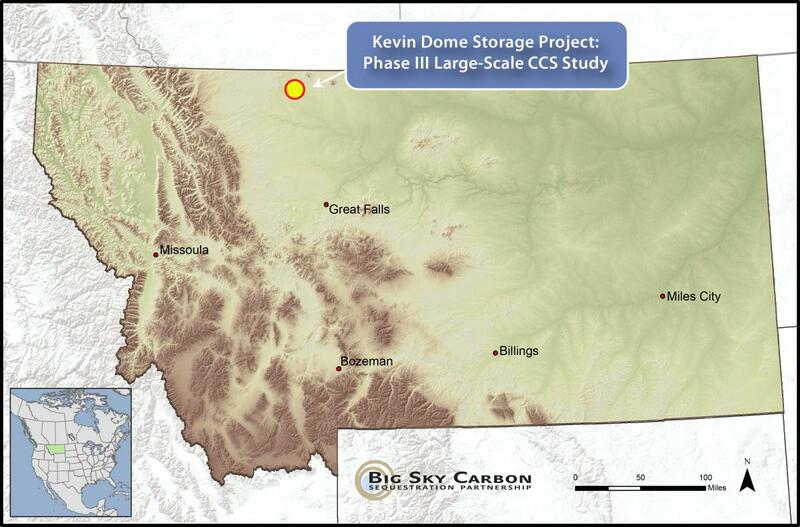 Extending more than 700 square miles, the Kevin Dome has naturally stored CO2 for millions of years. In addition, the Kevin Dome contains layers of thick impermeable rock on top of more porous rock layers. While the lower layers of porous rock serve to ‘trap’ and hold the CO2, the dense impermeable rock layers act as a seal, or ‘cap rock,’ and prevent the CO2 from migrating to the surface. Geologic characterization of the Kevin Dome site has been used in the preliminary modeling efforts, CO2 plume estimates, site selection, and risk assessments. In addition, site characterization activities informed the selection of well sites, including the first two characterization wells. The wells will provide additional geologic and geochemical data that are being incorporated into existing modeling efforts. For this project, characterization activities involved examining both the surface environment and the subsurface geology of the Kevin Dome. Accurately assessing the surface environment of the Kevin Dome has been very important for infrastructure development and field work. Information on land use and ownership, existing infrastructure, topography, and environmental resources plays an important role for risk analysis, project management, permitting, and research planning. 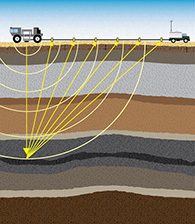 Surface characterization work also includes establishing baseline measurements of environmental parameters, such as surface and shallow groundwater sampling, soil flux calculations, hyperspectral imaging, and CO2 differential absorption LIDAR techniques. For subsurface characterization activities, BSCSP has analyzed existing geologic and well data; developed geologic models; completed a large 3-dimensional seismic survey; and drilled, logged and cored two wells within the project area. Prior to initiating activities in the area, BSCSP analyzed hundreds of wells for formation top depths and acquired dozens of well logs for analysis of other rock properties. BSCSP also evaluated existing regional 2- and 3- dimensional seismic data as well as produced water from USGS databases. All of this data was assimilated into a preliminary 3-dimensional static geologic model that will be refined in an iterative fashion as more data becomes available. The static geological model was then used for more sophisticated modelling which can predict the underground flow of the CO2 based on different rock parameters and injection rates. 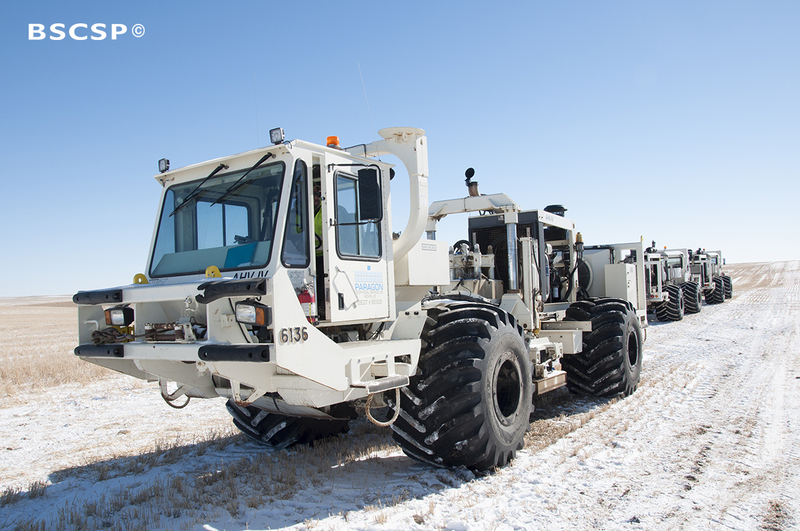 The 3-D seismic survey took place during the fall and winter months over a 3-year period. The survey covered more than 39 square miles within the research area. To achieve this, sensors (known as geophones) were temporarily installed at the surface. Geophones are about the size of soda cans and are removed once the seismic survey is complete. 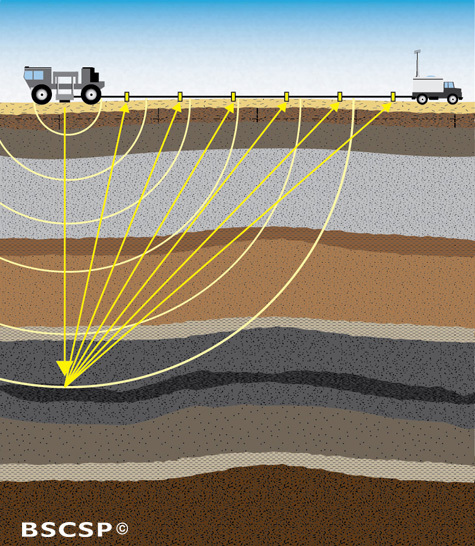 The purpose of the geophones is to collect sound waves produced by seismic vibroseis trucks driving along the surface. Also known as “Thumper Trucks,” the seismic trucks are equipped with large vibrating pads that release sound waves, which travel deep below the surface. As the sound waves encounter different rock layers and subsurface features, the waves are reflected back to the surface and information is transmitted to the geophone. Reflected sounds waves can provide a lot of important details on the underground geologic environment. For example, the amount of time between each sound wave can tell researchers the depth, location, and thickness of different rock layers located below the surface. In addition, the sound wave data is compiled, analyzed, and converted into images of the subsurface. These images are then processed and incorporated into the 3-D model of the larger subsurface setting. In 2014, BSCSP drilled two characterization wells in the project area. These wells provided additional detailed site specific geologic information. The first well was drilled to a depth of 3,800 feet and the second well was drilled to 4,696 feet. As the wells were drilled, on-site geologist collected rock cuttings from every 10 feet. Gas and fluid samples were also collected and analyzed during the drilling process. The next step was the coring process, which involved cutting and removing long cylinders of rock from the well hole. These “cores” are being tested and studied for their geologic properties and chemical composition. Cores were removed using 60 foot core barrels and protected in aluminum sleeves. In total, BSCSP cored 180 continuous feet in the first well and 240 feet in the second well. 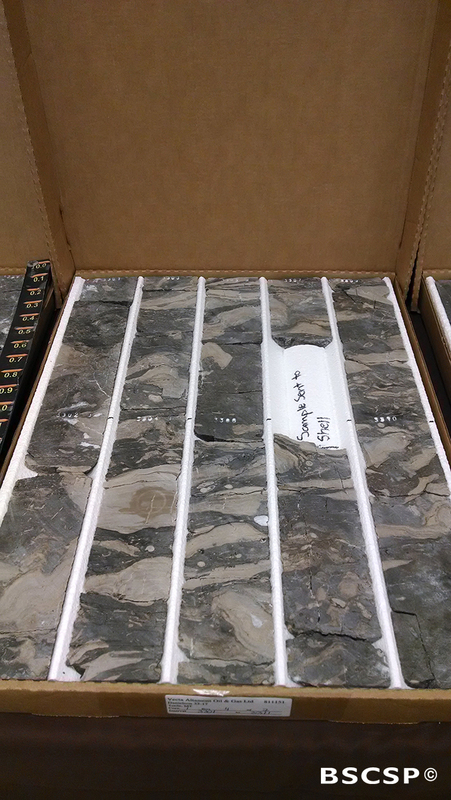 These segments provide researchers rock samples from the upper Duperow formation (which contains solid caprock), as well as samples from the middle Duperow formation, where the rock is more porous and contains CO2. The sleeves were then carefully packaged and transported to labs for initial measurement, testing and archiving procedures. Later, the core will be divided into samples of various sizes and shared with team partners for a wide range of testing and analysis. After the drilling of the main hole for the monitoring well was finished, the team began the logging process, which allows collection of a wide range of data from the underground layers exposed by the open hole. Logging involves lowering advanced measurement tools to the bottom of the well. The tools collect the measurements and data as they are pulled up slowly through the length of the well hole. The team monitors the logging process and the incoming data in real time from a large vehicle at the well site, which is equipped as a mobile laboratory. 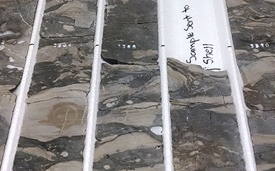 Through a suite of logs, the team can collect valuable information such as the depth and lithology (rock type) of each formation, the porosity of rocks that are filled with gas or liquid, the size and connectivity of rock pores, the existence of fractures, and other geologic properties, all of which will guide drilling, injection and monitoring activities throughout the life of the project. When the logging was complete, the drill team cased the well by inserting and connecting pipe one joint at a time down the length of the hole. The well was then cemented through a two-stage cement process, first cementing the lower section (from 4,700 feet deep to 2,390 feet), followed by the upper section (from 2,390 feet to the surface). Work on the monitoring well was wrapped up successfully on the evening of May 30th, and the drilling rig was moved off the site. In the laboratory, routine core analyses were performed for 110 core plugs from both wells. The analyses included bulk density, dry bulk density, grain density, ambient porosity, water and oil saturations, gas permeability, and lithological descriptions. Additionally, six plugs were chosen for X-ray diffraction analysis to determine whole rock mineralogy and help interpret the other results. Further work for the creation of thin sections and petrographic analysis is currently underway. Together, the logging and coring process provides important characterization details, such as the depth and lithology (rock type) of each formation, the porosity and permeability of rocks, the size and connectivity of rock pores, the existence of fractures, and other geologic properties. This information will in turn, guide drilling, injection, and monitoring activities throughout the life of the project.